Jonathan Toews #19, Patrick Kane #88 and Slater Koekkoek #68 of the Chicago Blackhawks celebrate a second period goal by Toews on an assist by Koekkoek against the New Jersey Devils at the United Center on February 14, 2019 in Chicago, Illinois. The Chicago Blackhawks faced long odds of getting a top-three draft pick in this year's NHL Draft, but they beat those odds and will pick third in the annual selection show later this year. The Blackhawks, who had a 2.5 percent chance of getting the first overall pick, were one of three teams that moved into the top three, joining the New York Rangers and New Jersey Devils. The Devils ended up winning the first overall pick for the second time in the last three years, and the Rangers will pick second overall. Going into the draft lottery, the Blackhawks had a less than eight percent chance of earning a spot in the top three. They had a three percent chance of earning the number three pick, a 2.7 percent chance of picking second, and a 2.5 percent chance of picking first. 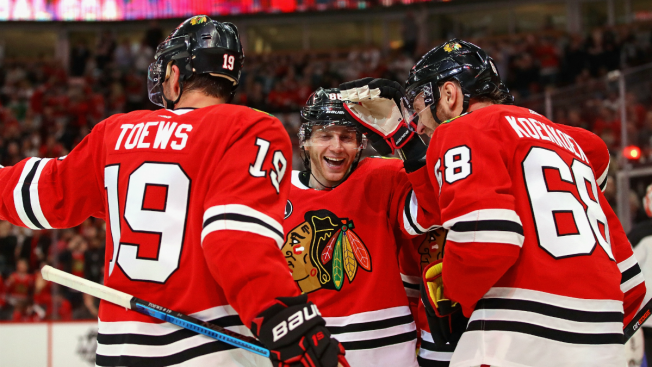 The Blackhawks will pick third for the first time since 2006, when they drafted center Jonathan Toews. In terms of who they could pick in the draft, it's likely that U.S. born forward Jak Hughes and Finnish forward Kaapo Kakko will be the first two players off the board, but Canada's Dylan Cozens and Russia's Vasily Podkolzin are both great consolation prizes in the third spot if the Blackhawks decide to take a forward. Kirby Dach and Bowen Byram could also be potential options if the Blackhawks decide to keep the pick. The NHL Draft will take place this June in Vancouver, and will air on NBCSN.